- Printed on one side, Customizable in various sizes. - Machine washable on a gentle cycle with cold water, line dry. - It is durable and will last for many years to come. - You can give this item as a gift at housewarmings, holidays and birthdays. 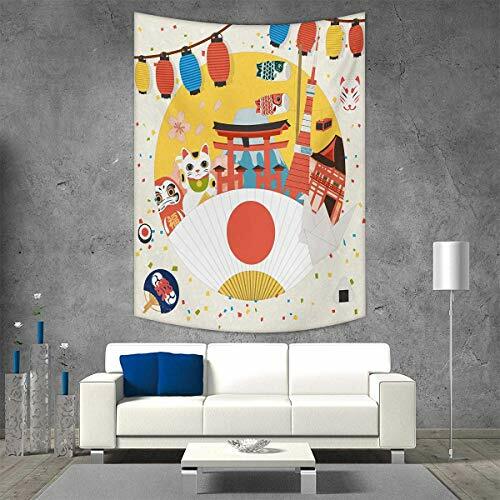 2.Printed on one side, Wall Tapestry sizes：W51" x L60"
3.MATERIAL: 100% polyester microfiber, soft to touch, skin-friendly and environment-friendly. Which is durable and perfect as an essential element for wall hanging. 4.MULTI-USAGE: It's not just a Wall Hanging, it can also be used as Bed Cover, Table Cloth, Bedspread, Curtain, Beach Throw, Beach Wrap-around,etc. 5. [Care Instructions] Machine washable in cold water with mild detergent and hang to dry. Don't bleach or tumble dry. The Color will stay nice and vibrant for years.